My guide, Odinn, greeted me at the small hotel in Hofn. “I will show you the northern lights,” he confidently assured me. That was good. That was one of the reasons I had chosen Iceland for vacation – a desire to see the magical northern lights, patterns dancing through the sky. “What will you do until tonight?” he asked. I must have had a questioning look upon my face, because he suggested I rent a car and drive to some of the nearby national parks in order to see more of the landscape. I sat there, perplexed. I had purposely chosen this particular tour because it said transfers, guides, and tours were included. I don’t like to drive. Driving tends to make me very sleepy. I had not planned on driving while in Iceland. So, not what I was planning, I rented a car. And set out towards Jokulsarlon, hoping to see the majestic glaciers and the smaller floes at the glacier lagoon. Despite the cold, the sun shone brightly. As I drove along the main highway, the ring road, I didn’t encounter any other cars. I saw the sign pointing towards the right. Jokulsarlon. I arrived just in time for a boat tour. It was one of the boats on wheels, those amphibious vehicles that go from land to water to land. 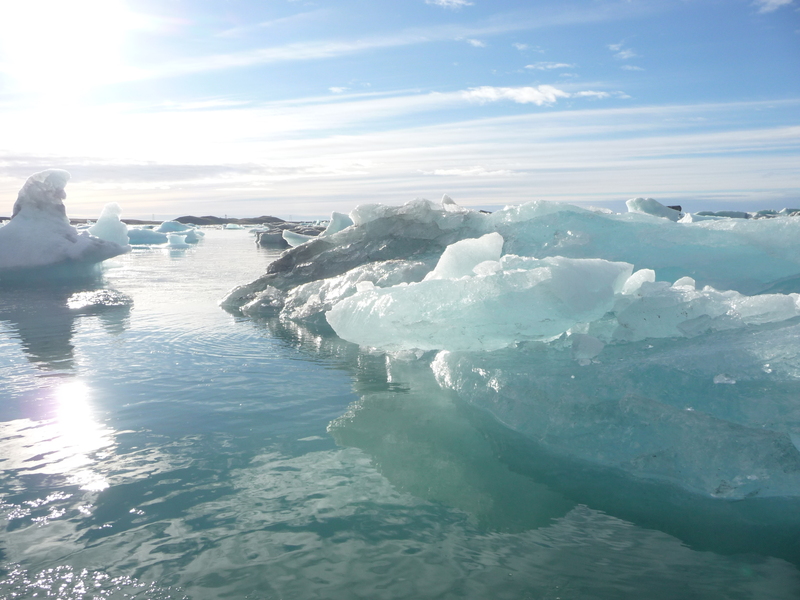 As the boat prepared to enter the lagoon, a smaller zodiac boat prepared the way for us, breaking the fine layer of ice that had formed on the surface. A thought suddenly struck me: Wasn’t this how the Titanic sunk? And I paid for this? After a few moments of mentally preparing myself for survival if I were to end up in the icy waters of the lagoon, I began to enjoy the ride. The light danced between ice floes, some dark, some white, some icy blue, some tiny, some large, some housing seals, others floating gracefully through the lagoon. It was an incredibly calming experience, on a boat, with only a few other people, in the middle of an expansive lagoon, listening to the ripple of the water and the distant calving of the glacier. Even though it wasn’t what I had planned, it was the perfect place to be. You have always had a knack for finding the perfect place to be – planned or no. Thanks for graciously taking us along for the ride.